Burst water pipes can be very disruptive, causing serious damage to your office or home. Often you may not even realise you have a burst water pipe until you receive a very expensive water bill. 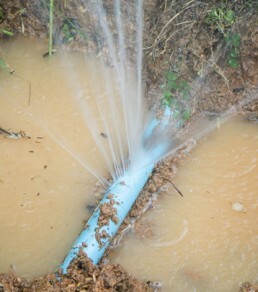 Some common signs of a burst water pipe can include clunking of the pipes when turning taps on and off, a wet soggy patch of grass on your lawn or a brand new swimming pool under your home. WHAT CAUSES A BURST WATER PIPE? Renovations – during a renovation, a water pipe may be hit or dug up accidentally. Worn pipe connections – pipes that are under high pressure can slowly pull apart or may just be worn away due to the age of the pipe. Extreme temperatures – causing expanding and contracting of the pipes. Water hammering – a clunking noise heard when turning a tap off quickly. If you have a burst water pipe, the first step you should take to reduce the damage done to your property is turn off the water mains. This is often found at the front of your property located next to a tap. The next step is to call Cheap N Reliable Plumbing and we’ll quickly respond to the problem.